Dubai scientists have been developing crops like quinoa that can thrive in the salty soils intruding into the world’s croplands but winning over enough people to eat them is proving a greater challenge. Also, researchers at the International Center for Biosaline Agriculture are trying to help farmers in the Middle East and beyond to earn their living from plants such as halophytes. Plants like from trendy quinoa and obscure salicornia, flourish in salty and arid environments where staple crops like wheat or rice would wither. 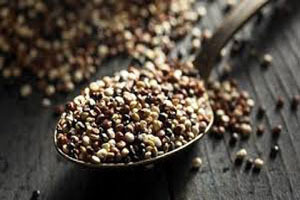 Through selective breeding, the non-profit research institute developed five varieties of quinoa -- a protein-rich, gluten-free grain that tastes like nutty rice -- that grow especially well in salty soil. The center is soon launching them in Egypt and Morocco. Experts at ICBA cultivate a patchwork of sandy plots on the fringe of Dubai’s desert interior. A vault where the temperature is kept at 2 degrees Celsius (36 degrees Fahrenheit) safeguards the fruits of their efforts: 14,000 types of seeds from more than 250 plant species. These seeds are enough for trial use and with necessary government and business support this can reach breakthrough to large-scale halophyte production. Planting of new crop is only the first step for ICBA, which operates projects in 28 countries from Senegal to Bangladesh and counts the U.S., Sweden and the United Arab Emirates among its top donors. The center will transform laboratory wins into commercial successes. “The marketing aspect is vital,” said Dionyssia Lyra, a halophyte agronomist at ICBA. “We need advertising. We need chefs.”The major challenge lies that quinoa is often more expensive than wheat, and many people are unfamiliar with products made from it. In rural Egypt, ICBA has strategically organized cooking workshops for 120 women to train them to prepare food from salt-tolerant crops. Changing palates has proven difficult in other markets.